An 8-PAGE OPENABLE I.D. 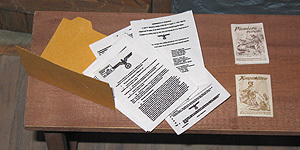 booklet, with photo and service records. 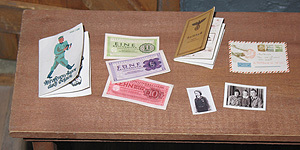 Three bank notes issued by the Third Reich. An airmail letter and two photos of the soldier's family. A Wehrmacht issued 6-PAGE OPENABLE booklet with cartoon Heer soldier on cover. These facsimiles have NOT been scanned in from some World War II collectibles book; each one has been photographed or scanned DIRECTLY FROM THE ORIGINAL ARTIFACTS!